Does helping others help you? We all know that exercise is good for us, but is the exercise of the heart, “reaching down and lifting people up” just as good for us? Dr Caroline Leaf is a communication pathologist and self-titled cognitive neuroscientist. 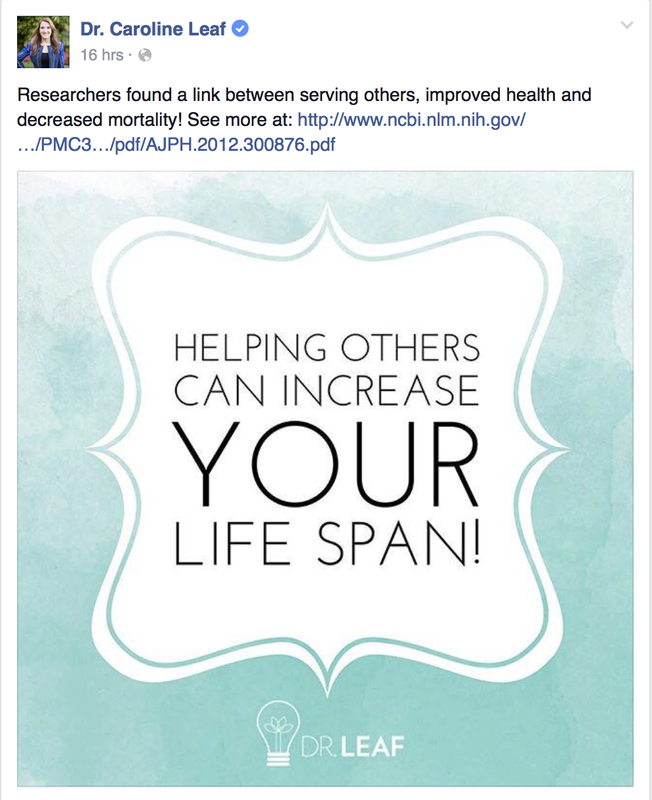 Her meme of the day today was a claim that “Helping others can increase your lifespan.” She explained that “Researchers found a link between serving others, improved health and decreased mortality! See more at: http://www.ncbi.nlm.nih.gov/pmc/articles/PMC3780662/pdf/AJPH.2012.300876.pdf”. The journal she referenced was a 2013 article by Poulin et al in the American Journal of Public Health . Poulin and his colleagues examined data from nearly 850 people in the Detroit area. At the start of their study, they asked their participants about stressful life events in the last year and whether they provided tangible assistance to friends or family members. They then followed their participants for five years and analysed the characteristics of who died in that time. According to the study by Poulin, those who helped others were younger, healthier, more likely to be White, of higher socioeconomic status, and higher in social support and social contact than those who didn’t help, all factors that have been shown to influence mortality. They also noted that 70% of their cohort didn’t experience any stressful life events. While they adjusted for these variables, their statistics would still be affected by them. As it turns out, while their results were significant, their numbers had broad confidence intervals, so the effect they found is very weak. What about other studies looking at the same question but in a different way? Well, there are mixed findings. Roth and colleagues published a study in 2013 in the American Journal of Epidemiology which also showed that care-givers had better life expectancy than matched controls  but then a number of other studies show the opposite. The Caregiver Health Effects Study found that those who were providing care to a disabled spouse and who reported some strain associated with that care had a 63% elevated risk of death compared with non-caregiving spouses . Other studies suggest that caregivers have poorer mental and physical health status than non-caregivers , and caregiving has been widely portrayed as a serious public health problem in the professional literature [4, 5]. > Firstly, correlation does not equal causation. Just because a study found those who helped others had a decreased mortality doesn’t mean that the reverse, helping others increases your lifespan, necessarily holds. There may be other explanations. > Secondly, other studies show conflicting results, so Poulin’s study may be a statistical hiccough. It’s not clear that helping others is actually good for our health. That doesn’t mean to say we shouldn’t help others. I think we should, if for no other reason than the golden rule, “Do unto others as you would have them do unto you.” But we can’t definitively say that helping others will help us directly by making us live longer. That’s scientifically still up in the air. Poulin MJ, Brown SL, Dillard AJ, Smith DM. Giving to others and the association between stress and mortality. Am J Public Health 2013 Sep;103(9):1649-55. Schulz R, Beach SR. Caregiving as a risk factor for mortality: the Caregiver Health Effects Study. JAMA : the journal of the American Medical Association 1999 Dec 15;282(23):2215-9. Pinquart M, Sorensen S. Differences between caregivers and noncaregivers in psychological health and physical health: a meta-analysis. Psychol Aging 2003 Jun;18(2):250-67. Talley RC, Crews JE. Framing the public health of caregiving. Am J Public Health 2007 Feb;97(2):224-8. This entry was posted in Biological, Caroline Leaf, Psychological, Social and tagged Americal Journal of Public Health, caregiver, caroline leaf, causation, correlation, golden rule, help, lifespan, mortality, Poulin, service, stress by cedwardpitt. Bookmark the permalink. Interestingly enough this post from 14 Jan is a more accurate depiction of this study. If a little over exaggerated. Hi Daniel, You might be right. I admit, I dismissed the meme in question as one of Dr Leaf’s fluffy baseless sayings. She certainly didn’t try and justify it.